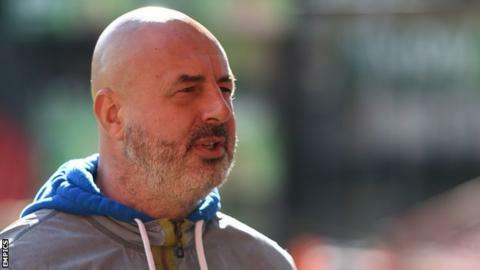 Rochdale boss Keith Hill says he must ensure the mindset of his players does not get worse after six games without a win. Dale are a point outside the League One relegation places after their 2-2 draw against Northampton Town on Tuesday. Hill's side had led through Ian Henderson's brace but David Buchanan scored a dramatic 78th-minute leveller. "You cannot allow the psychology [at the club] to get any worse," Hill told BBC Radio Manchester. "And you can't use a stick, you have to encourage players to hear one voice, which is mine. I've got to lead and support them. "I'm a fan of the players, I've recruited them, I'm a fan of the way we try and play but human beings react strangely. "We've got to rise above strange behaviour and decisions and stick to task, which is what we try and do." Despite winning just two out of 14 league games so far this season, Hill says he is still passionate about managing the side. "I enjoy this job and I want to continue enjoying this job. I've got memories all over my house about this football club and my family are supporters of this club," he added. "I get great support from the chairman and the board of directors and the players; it's a hard time and everybody realises that, but we'll come through it."